Femmes ; gesticulant et vociférant comme des Furies, rue des Pistoles. Les corps et les visages en sueur ; le mot salope ébrécha l'air une dernière fois. Frauen; gestikulierten und zeterten wie Furien, rue des Pistoles. Die Luft. Die junge Frau erschien in der halboffenen Tür: Kam langsam näher. Rue des Pistoles. - Ich glaube, sie ist nicht da, sagte sie, und schaute die Frauen an. 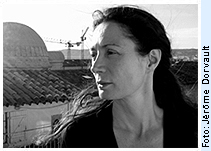 Florence Pazzottu lives and works in Marseille. She was the co-founder and editor-in-chief of the journal petite and worked in the centre international de poésie in Marseille. It was during this period that her first poems appeared in anthologies and magazines. In the late 1980s and early 90s, many of her radio plays were broadcast on French radio. Her first novel, “Les heures blanches”, was published in 1992 and was followed by a succession of books of both prose and poetry. Her short story “La Tête de l'Homme” (2008) has already been staged successfully as a play. Pazzottu often juxtaposes her texts with other art forms, her book “La place du sujet” for instance incorporating photographs by the French media artist and performer Giney Ayme.